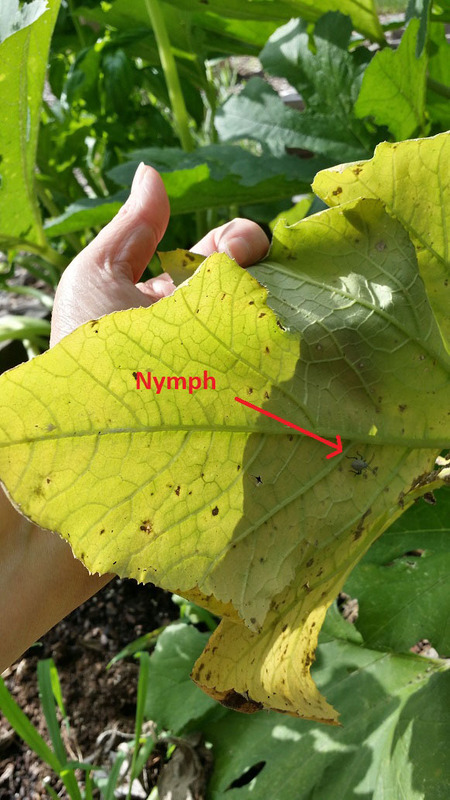 Summer squash is a foundation vegetable in most summer gardens, but it's plagued by pests. 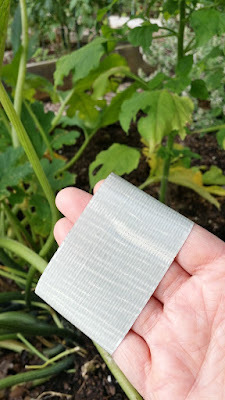 The two biggest culprits are squash bugs and squash vine borers, both of which I've had to deal with this season, and both of which will wipe out your summer squash in no time at all. I'm pretty much an organic gardener and do not use any pesticides on my vegetables other than a once or twice BT treatment on the tomatoes for hornworms, which is perfectly safe and natural. I don't spray my zucchini or yellow squash with anything at all, which means the dinner bell has been ringing for the pests in my garden. Now, the title of this post is a little misleading, as it's nearly impossible to get rid of all the squash bugs out of your garden, but you CAN control their population and the damage they do once you discover they are there. This is the first year I've ever grown zucchini and I love it. 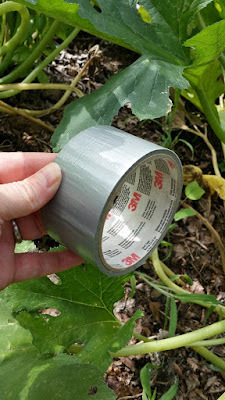 I pretty much expected pests and was prepared for what to do to mitigate their damage, while also learning what to do better for next year's garden. I can't take credit for this genius idea, as I originally found it at Quinn's site Reformation Acres last year. Pure genius! 1. First, identify that you have squash bugs. 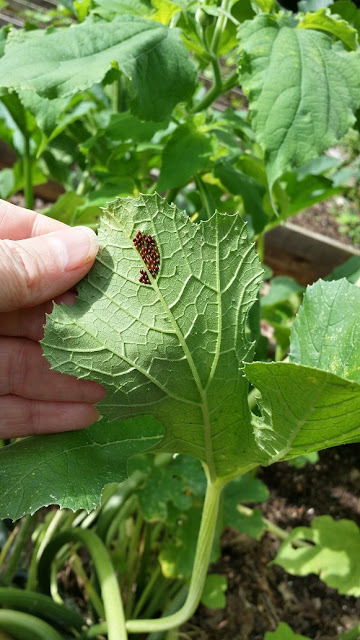 One of the benefits of having raised garden beds is that I can squat down and look up underneath the leaves of my squash plants, which helps me spot these clusters of copper colored squash bug eggs. Enemy identified! 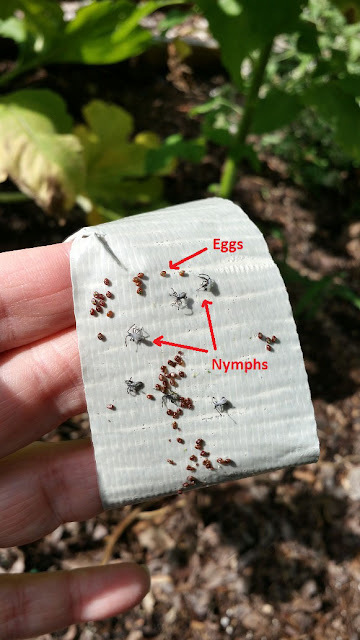 If there are eggs, there are squash bug nymphs. They are grey colored and are usually in large groups, but they don't stand still for pictures! Here's a blurry pic of one large nymph. 2. Next, get yourself some duct tape. 3. Tear off a 6"- 8" piece and wrap it sticky side out around your fingers. 4. 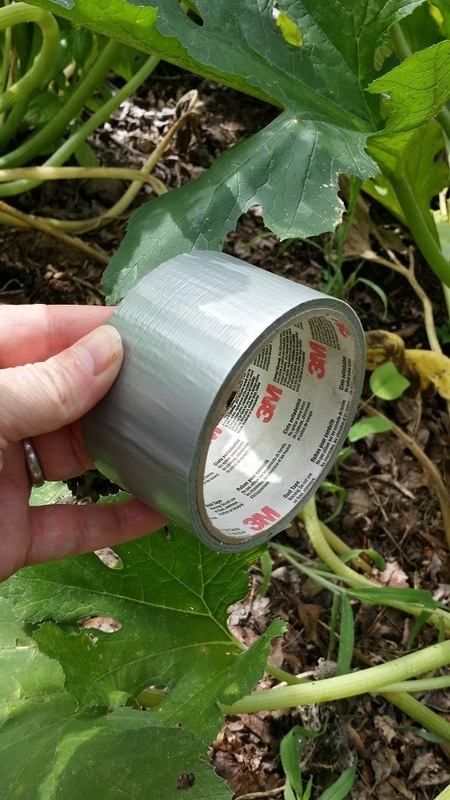 Use the tape to pick up the eggs and nymphs off the leaves. It's just like removing lint off a suit or dress, but grosser. 5. Throw away the piece of tape when it's full and repeat! You will find this very gratifying! I find that by doing this, it slows down the squash bug reproduction cycle immensely and prevents my garden from being infested. I won't have to go out and do this again for a couple of weeks. This trick also works for other pests like cucumber beetles and such. Viola!